2373 Riverside Dr. Danville, Va 24540 Contact Us: 434-729-2360 Hours Open: Sunday-Wednesday 11am-11pm Thursday 11pm-1am Friday-Saturday 11am-2am Part of a kid friendly chain serving American styled food and drinks in tavern like surroundings. 255 Lowes Dr. Danville, Va 24540 Contact us: 1-434-791-4428 Hours Open: Sunday-Thursday 11am-10pm Friday-Saturday 11am-11pm Branch of a family friendly steakhouse chain, offering Texas standards and a full cocktail menu! 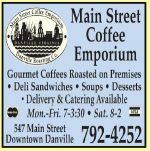 547 Main St. Danville,VA 24531 Call us at: (434)792-4252 Open hours- Monday-Friday 7am-3:30pm The Main Street Coffee Emporium focuses on their coffee quality, strength, and selection. They have a strong family atmosphere. The food ranges from a light snack to a full meal. Come in and enjoy rich coffee with a calm, inviting setup.